New York strip, filet mignon and rib-eye are three different cuts of beef that are frequently used to make a juicy and delicious steak. Both the New York strip and the filet mignon are cut from the tenderloin portion of the cow, while the rib-eye is cut from the rib portion. Choose a low-fat, low-sodium marinade to keep your steak healthy, and consider grilling rather than pan-frying to reduce the amount of fat. A 3-ounce serving of New York strip steak has 115 calories per serving, almost 20 grams of protein, almost 4 grams of total fat, 40 milligrams of sodium and 1.5 milligrams of iron. The majority of the fat is monounsaturated fat, with 2 grams per serving, although this size serving also has 1.8 grams of saturated fat. The New York strip has 53 milligrams of cholesterol per serving. 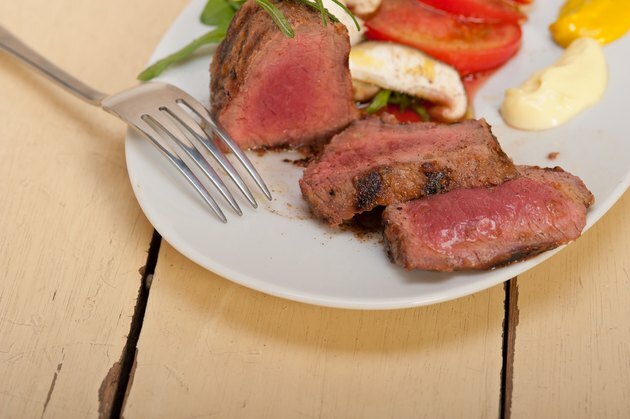 A 3-ounce serving of filet mignon contains 130 calories, almost 19 grams of protein, 5.6 grams of total fat, 48 milligrams of sodium and 1.4 milligrams of iron. This cut of beef also has 2 grams of saturated fat and 2.2 grams of monounsaturated fats per serving, as well as 55 milligrams of cholesterol. A 3-ounce serving of rib-eye has 137 calories, 17 grams of protein and a little over 7 grams of total fat. This size serving also has 1.9 milligrams of iron and 54 milligrams of sodium. The rib-eye cut has a slightly higher fat content per serving than the New York strip and the filet mignon. A 3-ounce serving has 2.7 grams of saturated fat and 3 grams of monounsaturated fat. The cholesterol count is 50 milligrams per serving. New York strip, filet mignon and rib-eye are considered part of the protein foods group. According to ChooseMyPlate.gov, women should consume 5 to 5 1/2 ounces of protein a day, while men should get 5 1/2 to 6 1/2 ounces. The Institute of Medicine recommends consuming between 46 and 71 grams of protein per day. These cuts of beef provide between 24 and 43 percent of the daily recommended intake of protein.